Before we begin today… I have a confession. I warned you at the beginning of this week that I was a novice at this concrete stuff. Sure… my paperweights and vase turned out fine… but…. …You should know that today’s project was an almost craft fail. It was NOT supposed to be a concrete step stone. 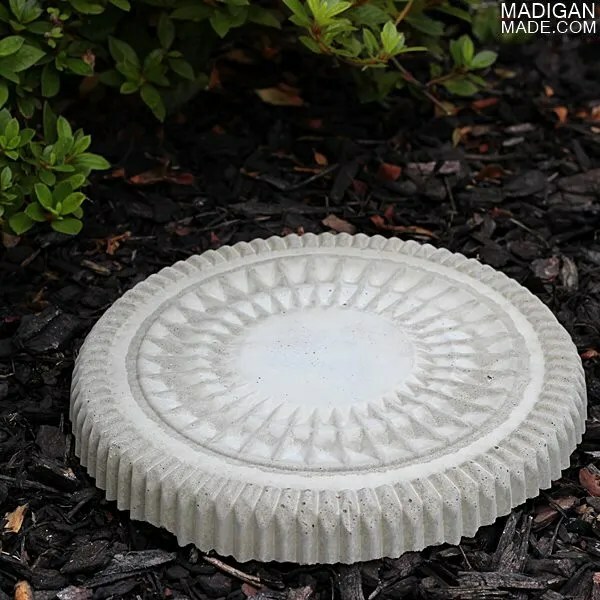 This piece of concrete was supposed to be a round cement tray with a cool, textured edge. I wanted to use it on our family room coffee table. 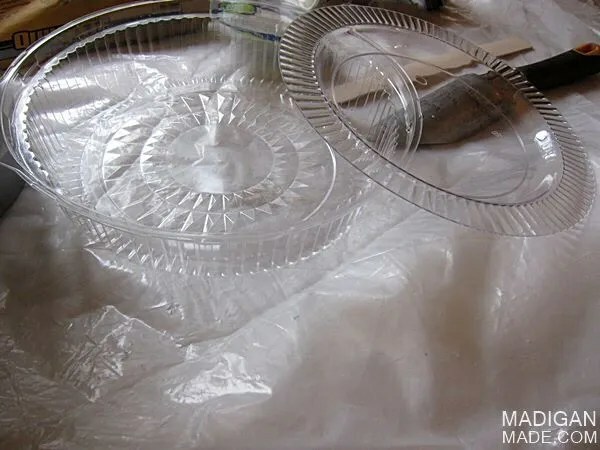 To make my tray-turned-garden-stone, I used an empty plastic lid to a catering container… you know, the kind that might’ve covered that tray of lunchmeat from your last party? Well, I thought the round shape and edges of it could make a cool tray. And, as you can see, that effort did not work out. Yeah, do you see a tray here? It’s kinda an uneven mess. But this project was not a complete loss. It taught me a few lessons… the importance of a level curing surface AND to look at the other side of things to see beauty, too. 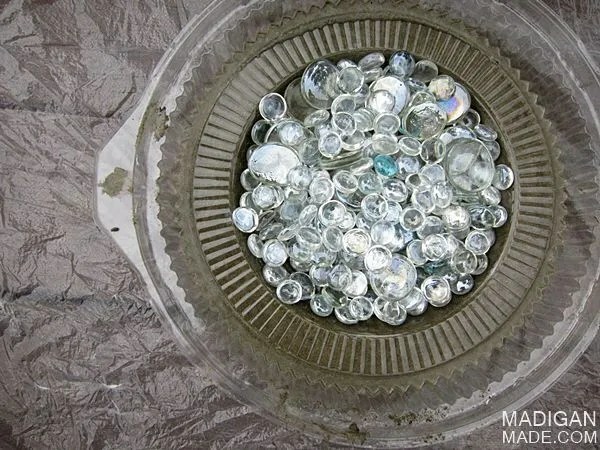 See, as it turns out, when I flipped the poured stone over, I was taken with the intricate design that the plastic tray left in the concrete! It almost looked like cut crystal… but in rock form! 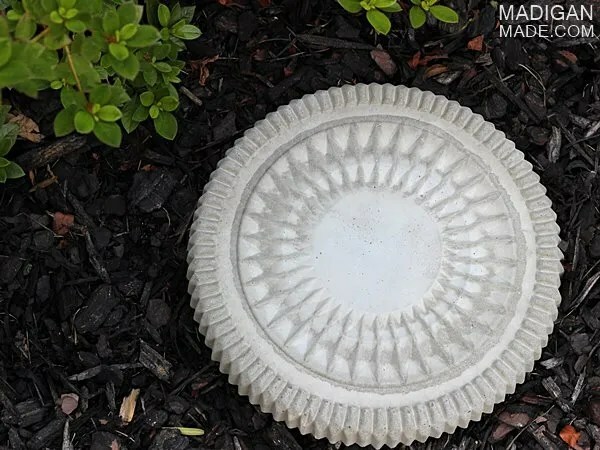 I thought the pattern was so pretty, that the piece might look nice in our landscaping beds and serve as a garden step stone. It’s funny how these things work out. 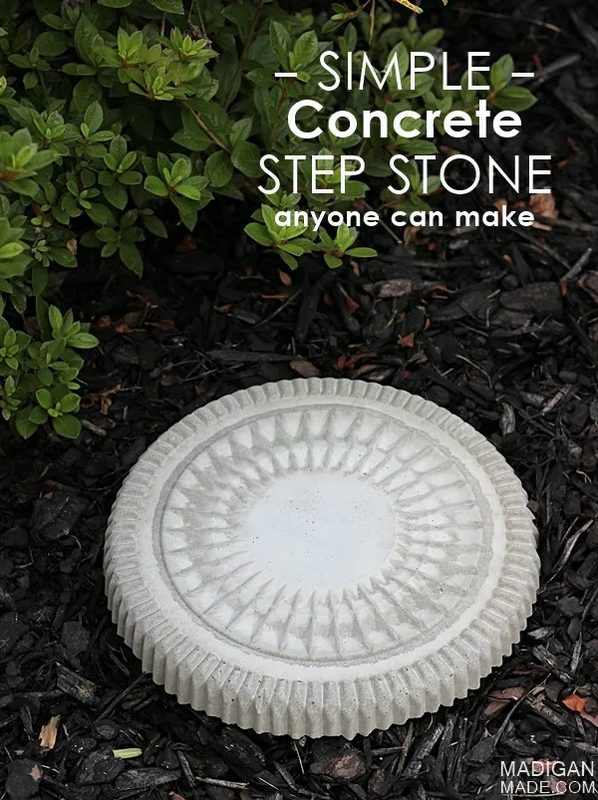 Want to make a garden stone? It’s easy! 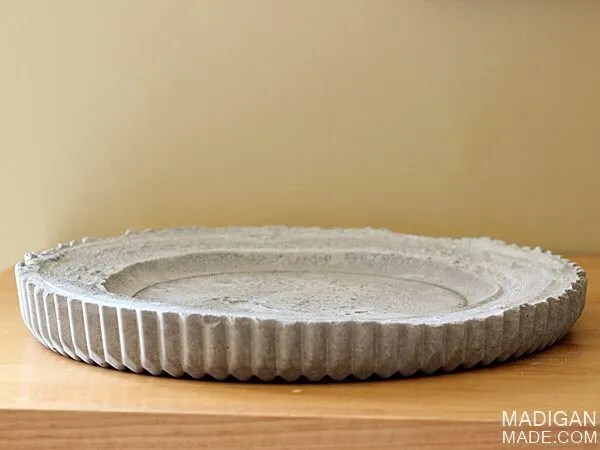 Before you begin, I recommend reading my simple tips for crafting with concrete. In that post I review a complete supply list, how to prep your area and tips create your concrete craft. If you want to try and make a tray, press your plate into the concrete and weigh it down with stones or rocks. (Maybe yours will turn out better than mine.) If you just want to make a garden stone, just pour it in and you are done. I did not seal the concrete, I just plopped it in my landscaping for now but I probably will go back and seal it with a clear spray or concrete sealer. If you are making a garden stone, I would wait several days to a week before walking on it. Since the concrete was thinner in the middle of my project, I’m not sure how often I’ll try to step on mine. But after seeing that pretty texture the catering tray gave the stone, part of me wants to make another one!! It looks so pretty in our garden! Do you have the concrete crafting bug yet? Stay tuned for tomorrow… I’ve got even more ideas to inspire you! !